Wild America, is a recounting of the 30,000 mile journey around North America that Roger Tory Peterson made with his good friend James Fisher. This book is part travel narrative, part bird watchers dream vacation, and most definitely an eyewitness account of the most pressing conservation concerns in the Country. Their descriptions of visiting areas famous for natural diversity and beauty took them to the sea cliffs of Newfoundland, the swamps of the Gulf coast, and the distant islands of the Aleutians. 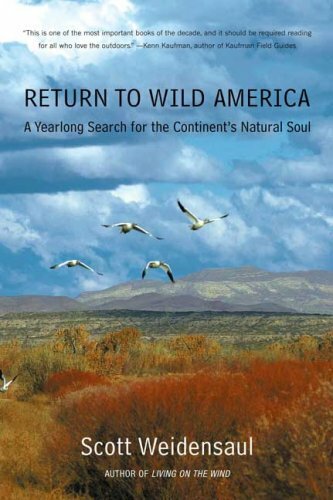 In 2000 science writer, Scott Weidensaul recounts Peterson and Fisher's journey in his book, Return to Wild America. Weidensaul uses the original text, influential to him as a youth, to narrate his journey, retracing the steps, and paying witness to changes to the landscapes that Peterson and Fisher had visited some fifty years prior. The two books stand alone but make a great set, perfect for your next 30k mile road trip.